I’ve been working on distilling more from the seminar. You never know what you’re really going to get out of any training situation; a speaker needs make his ideas stick or there’s not going to be much remembered. Jerri, a woman sitting next to me, said the takeaway from seminars (in general) is around 5%. I hope I’m doing better than that. Some pieces of the GTD process I’m still implementing, but I’m definitely answering the questions I set before myself. At one extreme, the bottom left, you have a lack of vision and control. If you have neither of these things, you are pretty listless and more than likely a “victim” of life’s circumstances. 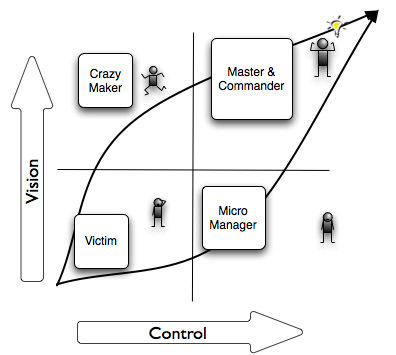 Great control with a lack of perspective creates micro-managers. A great perspective with no control makes you crazy and, by extension, ends up making everyone around you crazy too. However, when you have a good view and the ability to control (or regain control) of circumstances, you are really able to chart your own course. To fully acknowledge your world means you accept what is before you, that either internal or external change is inevitable, and the effects that change will have on you. To handle this you are in constant negotiations with yourself on what’s important. Finding what’s important means you understand the “why’s” of what you are actually doing by being honest with yourself and those around you. The snag that occurs, most often, is when fear enters the picture; fear can cause people to shutdown and avoid. Afraid to ask why you are doing what you’re doing? Even more so, scared of coming up with an unsatisfactory answer? That would require change, *aiee*! GTD makes you acknowledge the game that’s being played and enhance your gameplay by getting in control. It doesn’t stop there, though, that’s just accepting what you have to do to be excellent. You also have to be willing to act on that knowledge. Working up, from the bottom of “Action,” only a fool doesn’t choose to know or act. If, however, you act without thinking–without having purpose–you’re a loose cannon, barreling through your life and the lives of others with indiscretion. 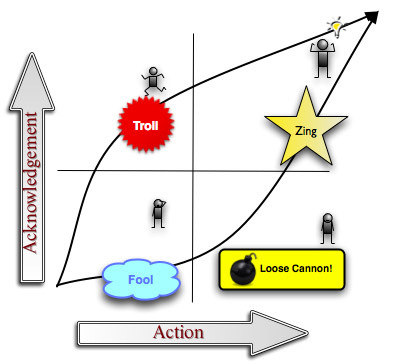 The situation could be different, a loss of willpower or, worse, mix laziness with intelligence and a troll is born: quick to give advice, but not so quick to put it in motion. (Don’t feed the trolls.) Bringing us full circle again, if you are willing to take the actions necessary to drive towards your higher purpose you will always be heading in the right direction. David said something powerful, to the effect of, “I am awash in the potential of opportunity before me.” By being the best he can be as a person, businessman, friend, and husband, life is working out well. To do that takes courage and willpower, seeing the vision and acknowledging its truth, controlling the situations he faces by acting appropriately in each. Just remember that Mr. Allen a person, and as far as I know we are all people, too. We can all do this. The only thing standing in your way is? Yourself. Once you have you down, the rest of GTD is just running the engine and keeping it tuned. We understand that to be a proactive force in your world is a tough battle on both an emotional and physical level. In Liquid Minded, we’re doing our best to create a tool that doesn’t get in your way, while being the perfect, supportive partner in living your life with vision and acknowledgment, in control of your actions. Great article. In general I’m a fan of the “two square” matrix for visualizing issues, problems, or ideas, e.g., vision vs. control. Acknowledgment vs. action is a smart one – I’ve been thinking a lot about great customer service, and you’ve given me another idea – thanks! Oops – Maybe that should be “four square” or 2d. Also, I should have said that giving names to each cell is fun. Great post. I love the diagrams!